I was honored to join a group of afterschool leaders to develop a set of quality standards for expanded learning on behalf of the CDE After School Division. This group was selected through a competitive application process and met several times over the past year to complete its recommendations. After the quality standards were reviewed by stakeholders across the state, they were submitted to the After School Division in June 2013. CDE approved the recommendations for the 12 Quality Standards for Expanded Learning and have released them in a full report. Program design and activities reflect active, meaningful and engaging learning methods that promote collaboration and expand student horizons. The program maintains high expectations for all students, intentionally links program goals and curricula with 21st-century skills and provides activities to help students achieve mastery. There are 12 standards in all. You can view a full copy of the report here. 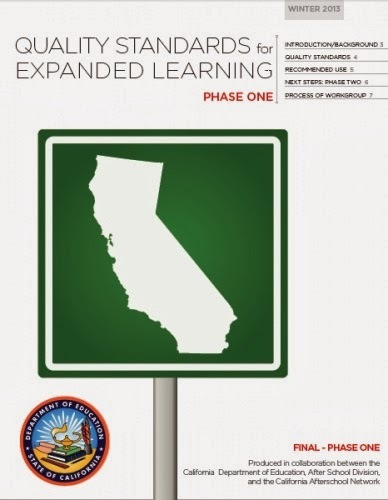 A second quality committee is being formed to consider the terms that require further definition, the need for a self-reflection tool, and other tools to help field leaders make good use of the California Quality Standards for Expanded Learning.